Just this Saturday I ran the Beginner Set Adventure for 2 of my regular players. Spoiler: We had tons of fun. I do not own the Beta, this was our first contact with the System. First off I am pleasantly surprised that there are more tokens in the Box then the included Adventure calls for, so you can easily run some more adventures just with this box. Thank you FFG! However it could use some more of the custom dice. The included pregen PCs are Archetypal: Smuggler, Hired Gun, Bounty Hunter and Colonist. I wager this is the point for a beginner set as they are easily recognized. I should mention that Colonist in this case is a Medical Droid. Most play styles will find a character that fits for them. Each character leaflet is well done and makes it easy for the player to understand and play the game. The back stories are short but well crafted and tie all the characters together in certain ways so you can hit it right off as there are already established histories and ties within the group. I also downloaded the two extra characters from the FFG website , a Technician and a Scout. I wonder why they where not included in the base game as they fill two gaps in the character lineup. Their back stories are also intertwined with the box characters and there is plenty of room in the box itself as there is mostly air in it. The Adventure is nothing too special but works. The approach is quiet different then other beginner adventures I have played. It starts right away in the middle of the action, which is always good. You run the characters through several different encounters and every encounter showcases different mechanics of the game. The structure us a bit different then a normal adventure and does not give the players much freedom at first. It actually plays a lot like a computer game tutorial would. Each scene focuses on a specific mechanism. Because of this the players have to go through certain parts of the adventure in a certain order. For anyone who as already played an RPG before this will feel very restrictive but it does serve the intended purpose. The maps are well done and highlight certain encounter areas and are not to battle map scale. Simply because the game does not use miniature combat rules like Savage Worlds or D&D 4 but a more abstract range band mechanism. Characters are in different range bands to each other and ranged weapons also have a max range band they are effective in. These bands are: Engaged, for when you are in melee, Short, Medium Long and Extreme. Movement between these bands requires between one and two maneuvers of which a character can do two at most at the cost of two strain. Strain is a kind of fatigue or stamina value that is affected in various ways besides normal combat damage and runs separate from the characters wound threshold. If either Strain or Wound Threshold reaches zero the character falls unconscious or dies. One of the things I was really worried about before hand is the dice pool mechanic. I usually despise dice pools as I feel they terribly slow down the game while someone counts a dozen dice or so. However EotEB is smart in that it not necessarily adds more dice to the pool when a character improves but instead upgrades dice. If you are not familiar how this works in general quickly head over here and give it a quick read, it explains the basics very well. I was really unsure if this would work. How would it feel and how would it affect flow? After the first encounter my players had it down and building a pool is surprisingly quick. But building the pool is only the first step, interpreting the result quiet another. And this is where the game really shines and left a huge impression on me and my players. In decades of gaming I have been mostly experiencing binary systems. You either pass a check or not and at best there is some form of degree of success or failure. However here there is rarely such a thing as a simple pass or fail. Instead every roll becomes a “Yes, but” or a “No, but”. You can succeed at the task but still produce a negative effect or you can fail but still produce a positive side effect. Besides some simple mechanical results it also opens up the possibility for the players to influence the narrative. If you fail your check but have enough advantage you may still benefit the group. For example while you miss your shot you hit a door control and a bulkhead slams down and cuts off further enemies from engaging the group. Every encounter had an awesome flow to it because of this mechanic and there was no such thing as a “normal” skill check. Both players were engaged the whole time because you never knew what would happen. It was not merely about succeeding anymore but about taking action first as that always opens up the door to unexpected developments. It kept me as the GM on my toes as well because I could never predict what would happen next. The players took to it after a while and spend their advantage in creative ways. And in addition to this it is also a very fast system! I am a fan of Savage Worlds but sometimes I felt that SW was a slow sludge compared to EotEB. There are very little stopgaps during play in EotEB and determining success or failure happens quickly simple because there are at most two symbols on a single die face. No calculating raises to determine if you wounded the enemy, or Rolling for unshaken etc. I feel the flow of the game is better in EotEB then in Savage Worlds but then this is the beginner game and there are no advanced features or combat options available that may slow the game down in the final version. What can slow down the game is thinking up stuff to do with Advantage or Threat however. But when stuck you always have some basic mechanical effects you can apply and move on, you do not have to come up with something creative. Additionally this mechanic also near perfectly captures the flow of the movies. In preparation of the game I watched parts IV-VI again and there are a lot of situations in the movies that I can easily see represented by rolls in the game. For example while Luke succeeds in blasting the door control so the stormtroopers cant reach him and Leia he also destroyed the bridge control and now must find another way across. Sounds to me like a success with Threat! An even better example would be the Prison scene. While the characters fail to win against the attacking stormtroopers Leia still has a Triumph and finds the garbage chute to flee through. They all succeed at their Athletics roll and land safely, however due to generated Threat they are in a trash compactor. And something is living in it. It attacks Luke. He now tries to desperately free himself and succeeds on the roll to do that, however again has some threat left and… the compactor activates! As you can see these situations can easily be represented by rolls during the game and a lot of similar things happened. It kept the story and adventure moving forward without solely relying on the GM to provide the excitement. Additionally to the dice mechanic the game also uses Destiny Points, a way for the players to directly affect the game without a dice roll. The interesting thing is that the GM and the players use the Destiny Pool together. Players use light destiny and the GM uses dark. Whenever you use a destiny point you flip it over to the other color. This results in a nice ebb and flow of the force so to speak. The number of destiny points is generated at the beginning of the Session and does not change during the game . At a basic level one can use destiny to upgrade an ability to a Proficiency die or making it harder for an enemy by upgrading a difficulty die. They are also used to activate certain abilities. The most exciting use however is the ability to introduce narrative facts. While something a GM wont have much use for as he usually does create the overall narrative it gives the players a great tool. The game changes from “Is there a ladder we can climb up?” to “I find a ladder on the floor almost hidden beneath the dust”. This makes the GM a bit more of a player himself as he now needs be on his toes to react to the players ideas even more than usual. On the bright side this also means he does not have to describe every little tiny detail in a situation because if the players want to do something cool they can simply establish that they can. While a full on dice less storytelling game is too abstract for me, this formalized approach works and led to some memorable moments. This is another strength of the overall system. The memorable moments did not come from a simple dice roll. In Savage Worlds for example the most memorable moments I have relate to someone acing their roll or dealing insane amounts of damage. Here the dice also enabled the memorable moments but they where more role playing driven. For example when the players were hunted down in a small alley one player established a Bantha was bound near and he scared the Bantha to stampede towards the enemies. This enabled the players to flee to safety. While not something overly spectacular it resulted form a player idea not from a player roll. This rarely happens in Savage Worlds as the Tactical Miniature combat is very mechanical and doe snot leave much imaginary room. But of course not everything is only shiny. For example I am not a fan of the hit point mechanic as it introduces the DnD problem of someone with one hit point acting as well as someone with 20 and all off a sudden dropping dead. Not sure how much of a problem this will be in the end. The other thing I am unsure about is the talent tree system. Coming from Savage Worlds, where everyone can be everything, returning to a class based system that even has a fixed talent tree and with that is even less flexible than DnD is a mayor change. The positive side of the fixed trees is that they are instantly familiar to anyone who ever played an MMO or certain Action RPGs so opens the door for new players. There is no confusion of what one has to learn to reach a certain Edge or Feat, it is all very clearly laid out. But you can not deviate from the fixed path. players are available. I can recommend the beginner box without a second though and I have already preordered the full game. The last time I was this impressed with a game I played Savage Worlds for the first time. And I am seriously wondering If Savage Worlds will still feel as awesome now that I have played Edge of the Empire. Kudos to FFG, it is a fantastic game. 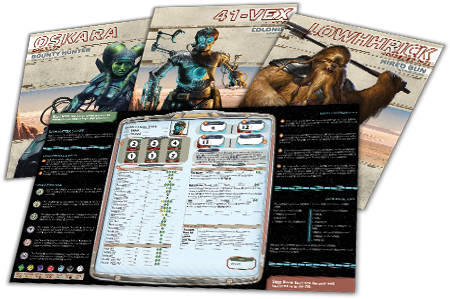 If you need further fodder there is a follow-up adventure to the one from the box available on the FFG Website. I can also recommend following the Triumph and Despair Blog where the author runs a play by post sandbox game and establishes the Edge of the Empire Alphabet for random game generation. I love it and plan to build my own games after the same model. Anyone of you played this game too? What are your thoughts? Please share in the comments below! Read you soon.